Experience high definition with CJ Tech's HDMI Cables. The HDMI 1.4 specification adds a data channel to the HDMI connection, enabling high-speed, bi-directional communication. Connected devices with this feature can send and receive data via 100 Mb/sec Ethernet, making them instantly ready for any IP-based application. Get high-end equipment at an affordable price with CJ Tech. Engineered to transfer two-channel stereo audio signals from media players, audio and video equipment. A superior connection to today's sophisticated home theater and home entertainment systems. Platinum Link will reproduce the complete spectrum of frequencies between your equipment removing signal distortion commonly found in lower grade audio cables. Precision-machined connectors provide maximum conductivity and superior signal transfer. Special four-layer design offers superior protection against EMI (electromagnetic) and RFI (radio frequency) interference. Colour-coded connectors for easy hook-up. 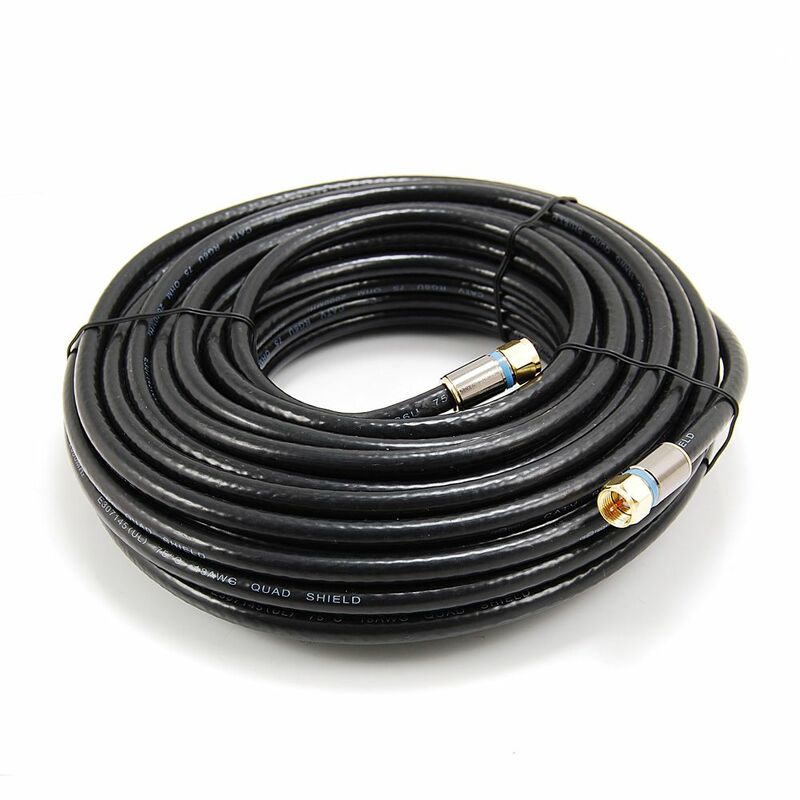 50 ft. RG6 Quad Shielded Coax Cable in Black For a connection between the device and device, transmission data and signal. UL certified high-quality cable. With two UL F-connectors on each end. 50 ft. RG6 Quad Shielded Coax Cable in Black is rated 4.7 out of 5 by 37. Rated 5 out of 5 by DeaN4U2C from The cable replaced a 30’ run I was using. I... The cable replaced a 30’ run I was using. I attribute the thicker shielding on this cable for the improved reception on my TV. Rated 5 out of 5 by DIYer from Product was the perfect solution for my application. Great Quality. Product was the perfect solution for my application. Great Quality. Rated 5 out of 5 by GrandpaJerry from Up-graded current picture and general reception significantly from old cable. Up-graded current picture and general reception significantly from old cable. Rated 5 out of 5 by Peggy from Outstanding coaxial cable great picture easy set for the RV... Outstanding coaxial cable great picture easy set for the RV parks.